Add flair to your kitchen with this stylish yet durable Vigo faucet. Chrome finish with matching soap dispenser all solid brass construction for durability and longer life. Faucet features dual pull-out spray head for aerated flow or powerful spray. Includes a spray face that resists mineral buildup and is easy-to-clean. This stylish and durable faucet is sure to give your kitchen sink a new look. Chrome finish with matching deck plates all solid brass construction which ensures durability and longer life. Faucet features spiral pull-down spray head for powerful spray and separate spout for aerated flow. Includes a spray face that resists mineral buildup and is easy-to-clean. 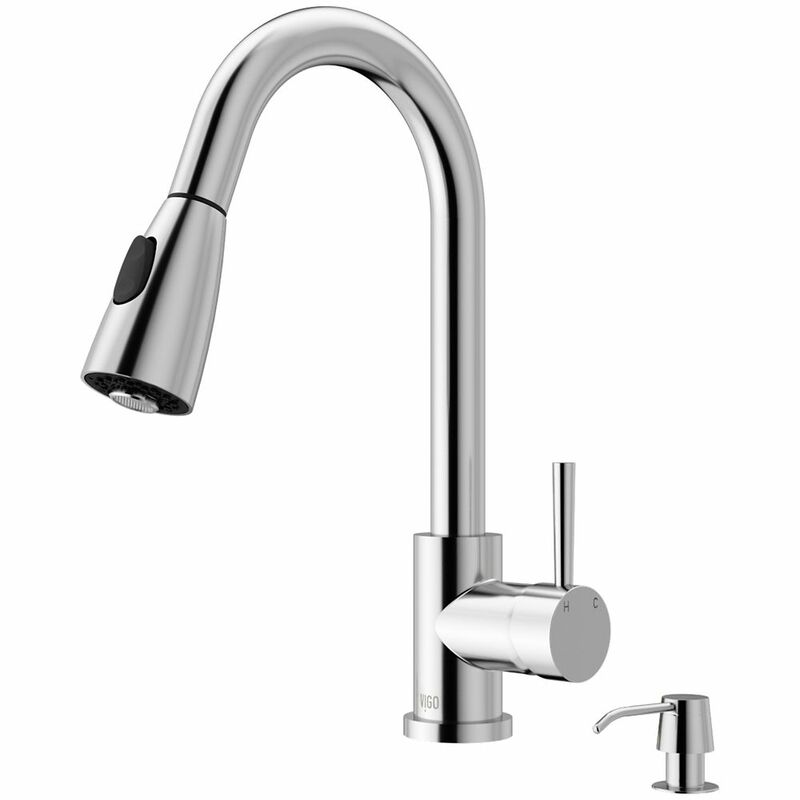 Chrome Pull-Out Spray Kitchen Faucet with Soap Dispenser Add flair to your kitchen with this stylish yet durable Vigo faucet. Chrome finish with matching soap dispenser all solid brass construction for durability and longer life. Faucet features dual pull-out spray head for aerated flow or powerful spray. Includes a spray face that resists mineral buildup and is easy-to-clean. Chrome Pull-Out Spray Kitchen Faucet with Soap Dispenser is rated 4.5 out of 5 by 28. Rated 4 out of 5 by FrankM from Good Looking Just installed by my plumber. So far no problems with this faucet. Rated 5 out of 5 by kmurph2 from Great Design! I had previously bought 2 bath faucets and I love them, so I ordered the kitchen faucet online. Love it! Same great design and quality. The way that it comes packed, it looks like a work of art.